for prizes in a number of categories including the longest Dolma. in the freshness of the ingredients. nothing to patent our national dishes," he said at the time. Turk is very likely now thinking about how to beat. Dolma Festival 2013- Largest Dolma Ever Made! We drove the 1h distance to Sartarabad with 3 cars and 13 repatriates for my very first Dolma Festival. Needless to say, it was a very good idea I had not eaten anything other than breakfast, considering the fact that each dolma was 100 dram (about 20-22 cents) and the fruits and accessories for the food free. Some booths had the dolma for free, which meant that they were out within 20-30 minutes from the start of the festival. The cost on the others was to prevent the same fiasco as last year, where people came with containers and filled them with food to last for the week. There were dolmas with grape leaves as per tradition, as well as fig leaves; some were with chichen, some with beef, some withveal, some with pork. There were even dolmas made with fish and crab. Most were quite delicious, each booth set up by a restaurant or culinary institute. Furthermore, what the point of a festival without song and dance? There were singers and dancers from different institutions, talents from all around Armenia shown off to the 1000+ spectators milling about or standing before the makeshift stage. There was a contest on who can eat the most alongside the contest for the best dolma and the largest dolma. Needless to say, the evening was filled with fun and laughter and stomachs so full we might not touch dolma for a couple of days, at least! PS: the dolma to win the “Largest Dolma” contest was 8.7 meters long!! Taste-Testers flocked through the flanked winged oxen of the Sardarabad memorial for the third annual Dolma Festival on Wednesday, July 10. Traditional music, singing, and dancing set the mood for the festival as 24 groups locked in a battle of vine leaves and stuffing for prizes in a number of categories including the longest Dolma, says an article in Asbarez. The festival was organized by the Armenian Cookery Traditions Development and Protection Organization (ACTDP) and exposed visitors to a number of variations of the traditional Armenian dish. Qajik Levonyan, a representative of the Araratian Restaurant , said that the name of the three thousand-year-old dish stems from the Armenian word Dol, which means vine leaves, and that the recipe’s secret lies in the freshness of the ingredients. Contestants were either representatives of restaurants or organizations. 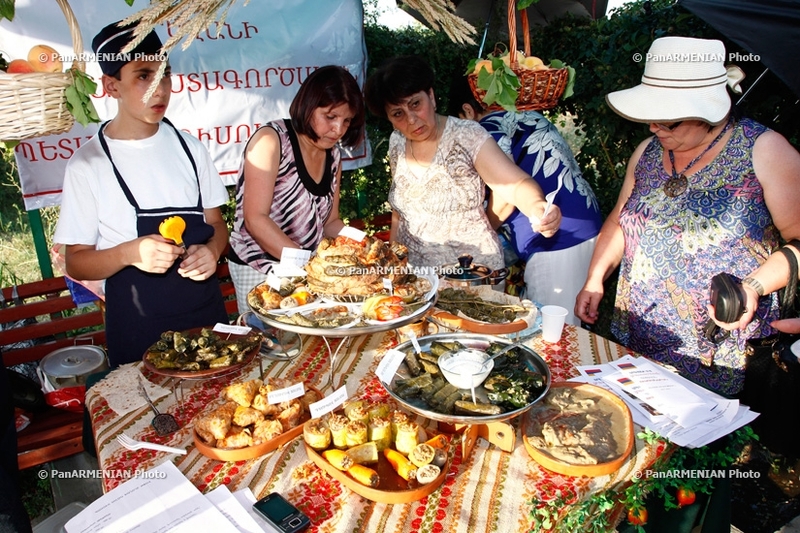 Members of the International Women’s Association in Yerevan (IWAY) were also rolling vine leaves at the festival and had a number of styles of the dish including Romanian and Syrian. Myrna Mugrditchian-Tcheler, President of IWAY, says that the festival is a great way to promote the group’s mission to the public and introduce Armenian culture to its international members while offering something in return to Armenia. United States Ambassador to Armenia John Heffern was seen at the contestants’ stalls, tasting the variations of the Armenian delicacy. He says he is a frequent visitor to such festivals and hopes to promote the specialties of the many Armenian “micro-communities.” Heffern says he is an avid dolma fan and thinks this festival is important in showcasing one of the important aspects of Armenian culture. A panel of five judges decided who walked away with the most prestigious titles in the Armenian culinary arts, including best tasting dolma. Judge Garen Komendaryan says that it is important to have a number of judges since food tasting is a subjective opinion. 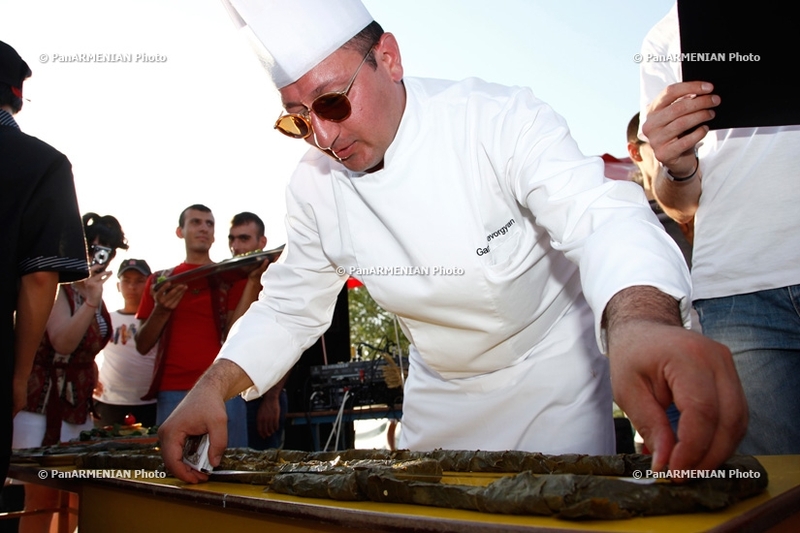 The festival, he says, is important in preserving and promoting the traditions in Armenian culinary arts “because without that we are not a nation.” Mugrditchian-Tcheler, who is also a judge at the festival, says the appearance, decoration, taste and originality are all taken into consideration when deciding on a winning dolma. Adel Nehmeh, a Lebanese national and visitor to the festival, says he came to Armenia with his mother to reconnect with his Armenian heritage and was pleasantly surprised at the grandeur of the dolma festival. The traditional dancing, singing, and music present at the festival all promoted a celebratory atmosphere in the venue and was great exposure for the vibrancy of the Armenian culture. The venue, Nehmeh says, was of particular interest to him as it showcased the gravity and pride of the Sardarabad battle. However, not all were impressed by the dolma presented at the festival. American-Armenian David Nazarian says he admires the social aspect of such Armenian traditions, but didn’t think there were “too many top-contenders at the festival.” Nazarian says, while incessantly slicing the vine wraps on his Styrofoam plate with a plastic fork and speaking with a mouthful, that he has had better dolma at home and at family gatherings. He says the dolma presented at the festival is “commercial” and is not a true representative of what the dish stands for. Head Chef and President of the Armenian Cookery Organization, Setrag Mamoulian, took to the stage, as the sun began to set behind the 85-foot tall bell tower, to announce the winners of the festival. Backed with song and dance, a 25-foot dolma tray was held up at the venue’s stage by its makers, and the winner of the “longest dolma” contest, Garine Restaurant. IWAY walked away with the honorary title of best tasting dolma, while Araratian Restaurant’s version was awarded for best presentation. The judges crowned the chefs from Arvasar Restaurant as the festival’s winners. The day ended with stomachs full of dolma and the exhaustion attributed to a festal Armenian gathering. Armenian dolma to be registered in Guinness Book? 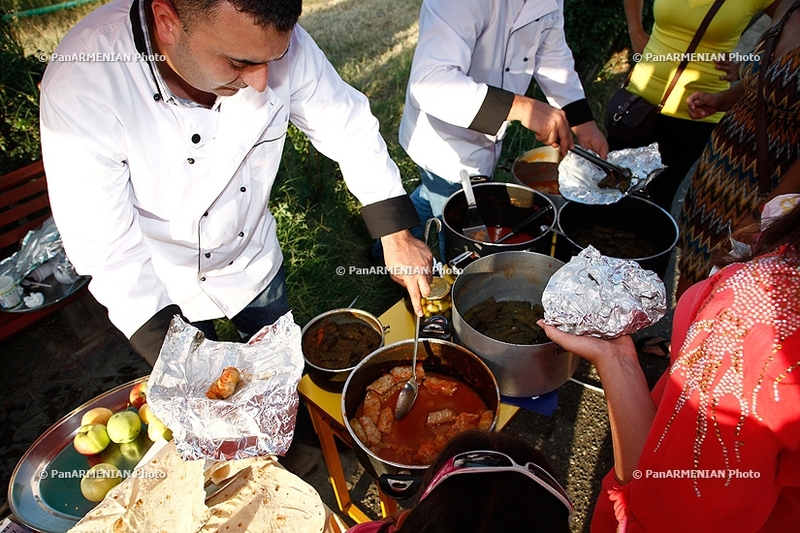 The participants of this year’s Dolma Festival, to be held near Armenia’s Sardarapat Memorial Complex on Wednesday, have been tasked to prepare the longest dolma ever made. Concordantly, representatives from the Guinness Book of World Records have been invited to the event, to register the world record, Asbarez.com reported. “The key objective of the event is to promulgate traditional Armenian dishes and to develop and strengthen Armenian cuisine. The festival has another important objective, too: to confirm the Armenian origins of dolma,” noted Chairman Sedrak Mamulyan of the non-governmental organization Development and Preservation of Armenian Culinary Traditions. “The Dolma Festival coincides with the Golden Apricot’ [International] Film Festival. It is a wonderful opportunity to introduce Armenia’s national cuisine to guests from a variety of countries,” Film Festival event organizer Vardan Hakobyan added. Representatives from the organization Youth informed that the duration of the Dolma Festival will be extended next year and cooks from Artsakh will join their colleagues in Armenia. A woman holds up a plate of assorted dolma at the third annual Dolma Festival in Sardarabad, near Yerevan. 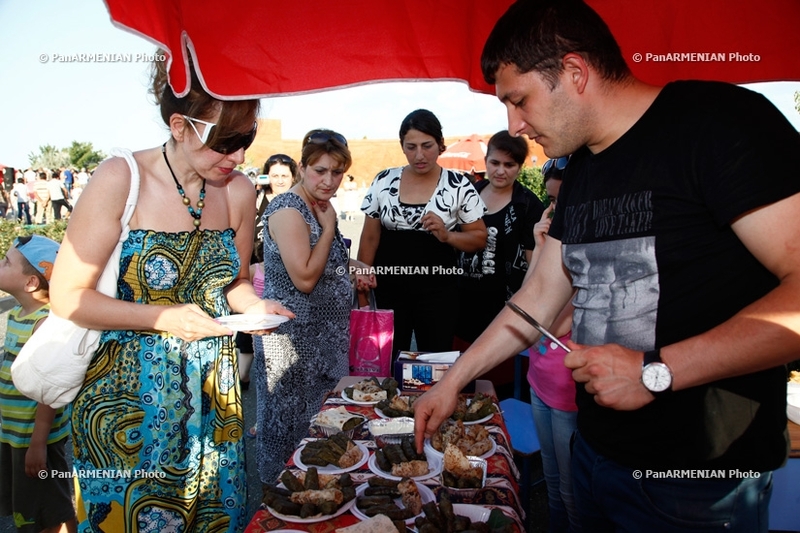 YEREVAN—Taste-Testers flocked through the flanked winged oxen of the Sardarabad memorial for the third annual Dolma Festival on Wednesday, July 10. Traditional music, singing, and dancing set the mood for the festival as 24 groups locked in a battle of vine leaves and stuffing for prizes in a number of categories including the longest Dolma. An entrant in the "Longest Dolma" contest. You mean dol-baba as in Dole banana? Sorry. I don't speak dolma furkish! Edited by Arpa, 14 July 2013 - 11:32 AM. 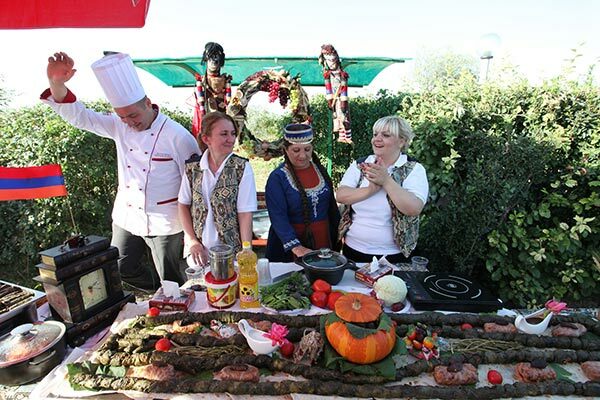 Armenian chefs cooked what they hoped would prove the world’s longest tolma at the national dish’s festival in Sardarapat, Armavir province, on Wednesday. The event held annually for the traditional Armenian ways of wrapping meat in grape leaves attracted many participants and guests of the 10th international film festival, Golden Apricot, being held in Yerevan this week. Keith Bonner moved to Hollister from San Jose six years ago to be closer to three of his four adult children. Wanting to share his heritage, Bonner was found this holiday season preparing traditional Armenian dolmas to share with his family on Thanksgiving Day. Bonner learned this recipe from his “mother who was full blooded Armenian,” who in turn learned this recipe from her mother who was born and raised in Armenia. When it comes to dolmas, Bonner said, “We have had it (dolmas) since we were little. It’s always been a family dish at get-togethers. My mother had six siblings and when we got together we always ate these and other Armenian dishes." Bonner’s grandparents moved to the United States from Armenia in 1912 to, as he explained, "escape the persecution of the Turks against the Armenians". This persecution would lead to the Armenian Genocide three years later during WWI. The Armenian National Institute's website estimates that of the two million Armenians found in the Ottoman Empire prior to WWI, one and a half million died between the years of 1915 and 1923. Wanting to keep his heritage alive on Thanksgiving Day, Bonner prepared his family recipe, just as his mother did, to share the dish he grew up eating with his own family. “It is a tradition to pass down so you don’t forget your Armenian roots,” Bonner serves dolmas on Thanksgiving Day, next to the traditional turkey and stuffing. Once cooked dolmas can be served both hot or cold. Bonner’s family recipe is listed below. DOLMAS Recipe ingredients - one pound of ground beef or desired ground meat, one jar of grape leaves, half of a large onion, half a cup of long grain white rice, salt and pepper to taste, one eight ounce can of tomato sauce, and half a handful of parsley. Step 1 - Mix raw meat, rice, salt, pepper, tomato sauce, diced onion, and parsley together. Step 2 - Roll out grape leaves from jar. Step 3 - Place desired amount of mixture onto the base of the grape leaf. Step 4 - Roll the grape leaf from the bottom, folding in the sides as you go. Step 5 - Place rolled dolma in a pot until the pot is full. Step 6 - Once full fill the pot with enough water to cover the bottom layer of dolma's. Step 7 - Place the pot full of dolma's on the stove. Bring the pot to a a boil with the lid covered. Step 8 - Once the water boils, turn the stove down to a low boil, like cooking rice, and heat for one hour.